Tuckerman Babcock, of Soldotna, is the new chairman of the Alaska Republican Party. Tuckerman Babcock, a long-time Republican strategist and former aide to Gov. 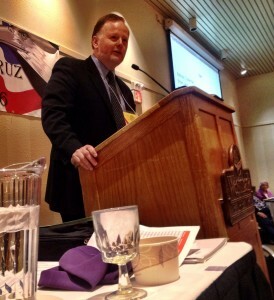 Wally Hickel, is the new chairman of the Alaska Republican Party. Babcock won the spot at the state GOP convention in Fairbanks today. He beat Fairbanks attorney Ann Brown. Convention participants also changed party rules to end the term of the prior chair, Peter Goldberg, at the end of the convention, this afternoon. That means Babcock will be a delegate to the National Republican Convention in Cleveland in July. Babcock will go to the convention in Cleveland as a delegate for former candidate Marco Rubio. (Per state party rules, the five Rubio delegates will be the first among the Alaskans to be “unbound” and free to vote their will.) Babcock says he’s not sure whether he’ll ultimately vote for Ted Cruz or Donald Trump, but he says he will not support an alternate candidate. Babcock is a 1978 graduate of Anchorage’s Steller Alternative High School. He is also the son-in-law of former state senator Lyda Green of Wasilla.